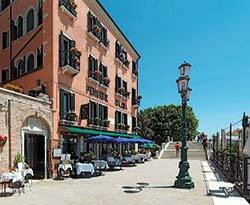 The Hotel La Calcina (formerly the Pensione Calcina) is a three-star, 27-room inn that faces the Giudecca Canal in Dorsoduro. It has a long history: In 1876, John Ruskin lived in room No. 2 while writing The Stones of Venice, and many other famous artists and writers have spent time at La Calcina over the last 150 years or so. If you have a room with a canal view--or if you're having a meal on the hotel's restaurant terrace--you'll enjoy watching water buses, car ferries, barges, and cruise ships pass by. As you leave the Alilaguna Linea Blu floating boat pier at Zattere, turn right and walk a short distance along the Giudecca Canal waterfront. The Hotel La Calcina is located right before a stone bridge, facing a restaurant terrace on the water. You'll find the Hotel La Calcina right before another stone bridge, facing a restaurant terrace on the water.